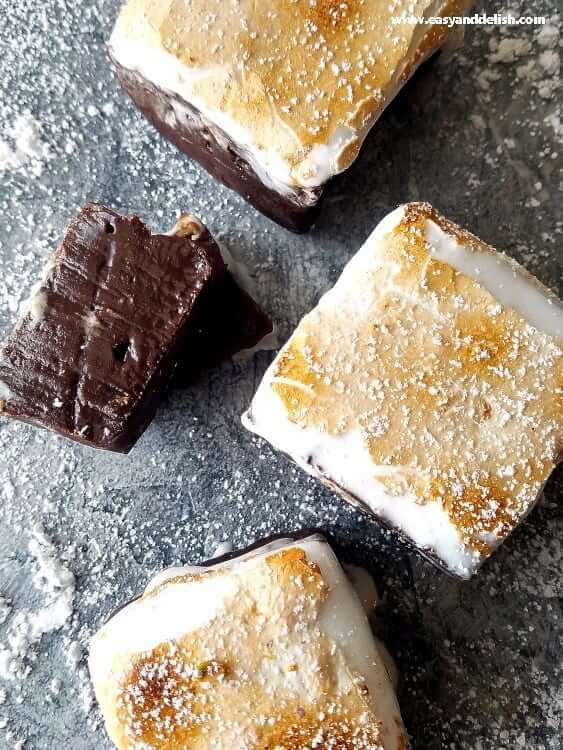 Hot Chocolate Fudge is a 5-minute holiday dessert made from chocolate fudge topped with toasted marshmallow creme. The best way to EAT your hot cocoa: it’s bite-sized pure comfort! It’s time to celebrate that wonderful time of the year again… Yaay! But I know that it can also sometimes leave us feeling overwhelmed, with all the shopping and food prepping. Well, with that in mind, I made a treat that is both budget-friendly and stress-free: this Santa’s Hot Chocolate Fudge. Just typing the words makes my mouth water! I think Santa (a.k.a. my hubby) and his elves (our kids) will be quite happy. … it’s something that can be put together in only 5 minutes, using 4 staple ingredients. In addition, it’s gluten-free. Now how great is that? 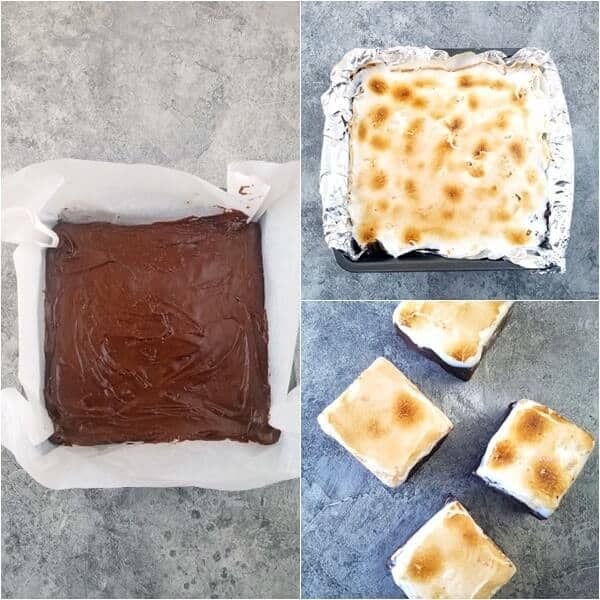 All you need are these 4 ingredients: sweetened condensed milk, chocolate chips, vanilla extract, and marshmallow creme. Our Hot Chocolate Fudge makes a great dessert for entertaining or for edible holiday presents… as well as an easy-to-carry treat for celebrations anywhere. If you enjoy quick and rich chocolate desserts like this Hot Cocoa Fudge, you might also try our Hot Chocolate Trifle. Quick and easy dishes are one of my secrets for surviving the holidays, while saving time to spend with my family and get all the shopping done. Butter a 8 x 8-inch pan and line with either parchment paper or aluminum foil for easy removal; set aside. Combine sweetened condensed milk and dark chocolate chips in a large microwave-safe bowl. Heat mixture on high for 90 seconds. Remove from microwave and stir well. Only if needed, heat an additional 30 seconds, stirring until chocolate is completely melted and smooth. Stir in vanilla extract and then pour fudge into prepared pan, creating an even layer. Let set for about 5-10 minutes in the refrigerator to speed up the process. Then, heat the marshmallow creme for about 20 seconds in the microwave and pour it on top of fudge. Smooth it over! Broil for about 2 minutes; then freeze for 1-2 hours. Cut into squares and serve. Store in a clean airtight container, preferably in the refrigerator for up to 3-4 days (only on account of the marshmallow creme). Fudge is a confection that is basically made by combining sugar, butter, and milk and then heating to the soft-ball stage at 240 °F (116 °C). The mixture is then beaten while it cools, giving it a smooth, creamy consistency. Chocolate, caramel, dulce de leche, nuts, dried fruits, marshmallows, crushed candy, etc are a few ingredients that you can add to fudge to make it more interesting. Substituting sweetened condensed milk for sugar, butter, and milk can greatly simplify and speed up the fudge-making process. Because sweetened condensed milk is already creamy, the beating procedure required in the traditional recipe becomes unnecessary. Store fudge for up to 2 weeks at room temperature. To extend its life shelf, store it in the refrigerator for up to 3 to 4 weeks, or freeze for up to 3 months. 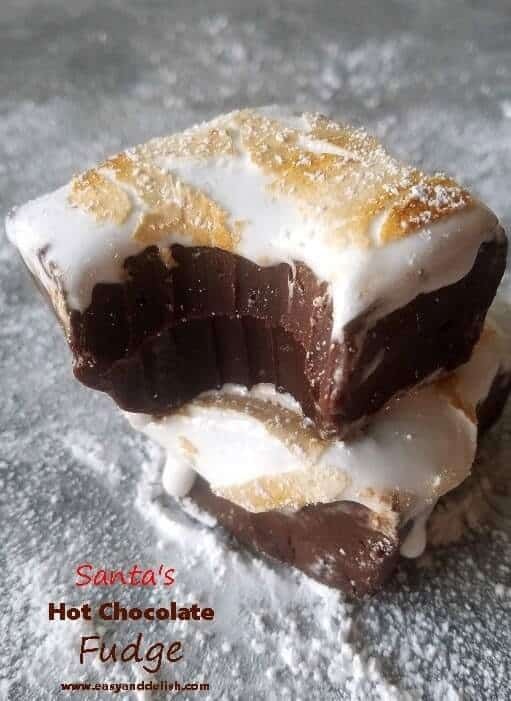 Hot Chocolate Fudge is a 5-minute holiday dessert made from chocolate fudge topped with toasted marshmallow creme. The best way to EAT hot cocoa: it's bite-sized pure comfort! 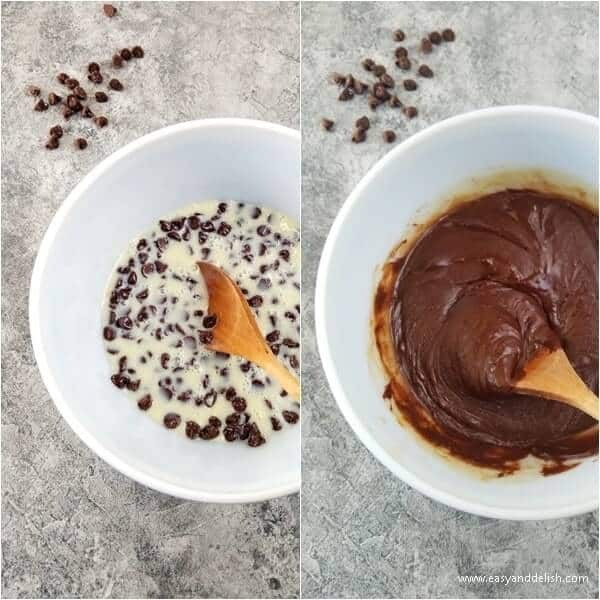 Combine sweetened condensed milk and chocolate chips In a microwave-safe large bowl. 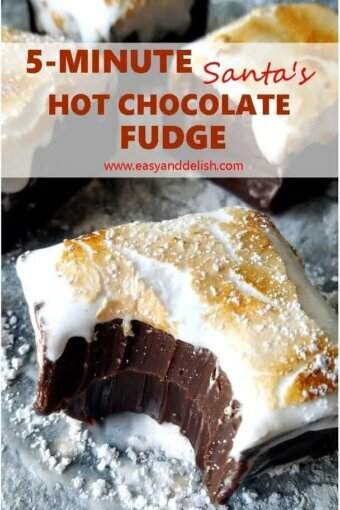 Then, heat the marshmallow creme for about 20 seconds in the microwave and pour on top of the fudge. Smooth it over! Broil for 2 minutes; then freeze for 1-2 hours. Cut into squares and serve. Substitution: If you'd like to, you can use bittersweet chocolate chips instead. I prefer dark chocolate because it better balances the sweetness of the condensed milk and marshmallow creme. Store in a clean airtight container, preferably in the refrigerator for up to 3-4 days (on account of the marshmallow creme). Love hot chocolate? 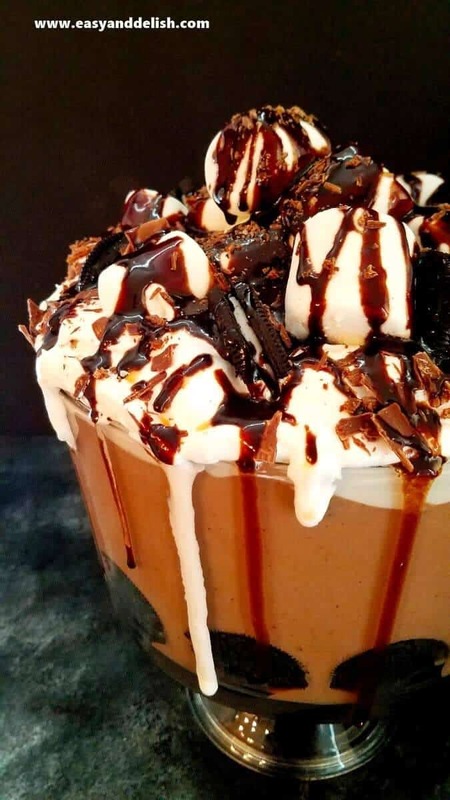 Try our Hot Chocolate Trifle ! There are some things – like this fudge – that are just TOO good! I have no choice but to hypnotize myself into believing that this fudge requires 50 ingredients, a sous vide machine, and that the chocolate has to be tempered. Otherwise, I’ll be having this for breakfast, lunch, and dinner! This looks terrific — extremely creative. Wonderful flavors — thanks. Five minutes? I’m in! December is always so busy, time saving recipes are a life saver. This recipe is incredible! I’ve never imagined mkaing a chocolate fudge just in 5 minutes. You ROCK, Denise! One of those hit recipes yet so simple to make. Ty!